Electrical Services | Southern Lighting Services, Inc.
As an electrical contractor, Southern Lighting Services provides a full range of electrical services, including but not limited to: diagnosing tripping breakers, detecting underground wiring faults, panel change-outs and upgrades, new circuit installs, re-models/up-fits, and energy audits. Sometimes electrical systems malfunction, increasing the risk for a potential electrical hazard. Southern Lighting Services operates a 24/7/365 emergency service hotline that enables us to respond promptly, sending experts to diagnose the problem and neutralize any potential danger, whenever it may occur. Underground wiring faults can cause major problems for businesses. 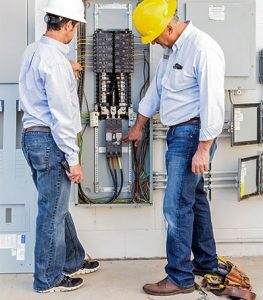 Fortunately, Southern Lighting Services has both the equipment and experience necessary for locating these underground faults, saving your business time and money. If you’re looking to up-fit your building or place of business, let Southern Lighting Services facilitate the design and modification to existing electrical systems and circuits to ensure you have enough power where you need it. Southern Lighting Services ensures quality work done right the first time. With the cost of electricity on the rise and the need to lower operating expenses becoming a major focus for many businesses, energy audits have become increasingly valuable. Energy audits allow us to determine areas of your business that consume excessive amounts of power, and to make recommendations for modifications and/or upgrades that will save you power and money. Designed to save power, Emergency Management Systems (EMS) can be designed specifically for your needs, allowing you to maintain complete control over lighting systems, HVAC, and other electrical circuits. We also can manage, repair, and replace existing EMS systems should your business already use one.